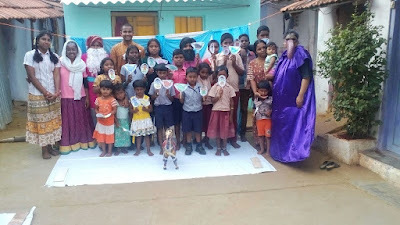 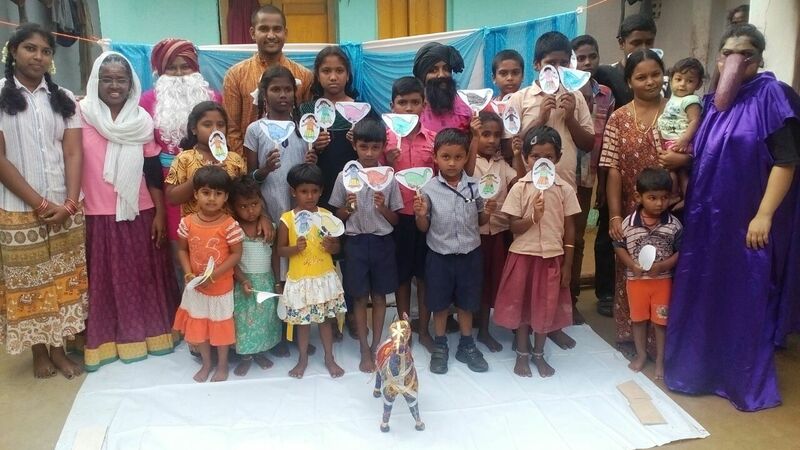 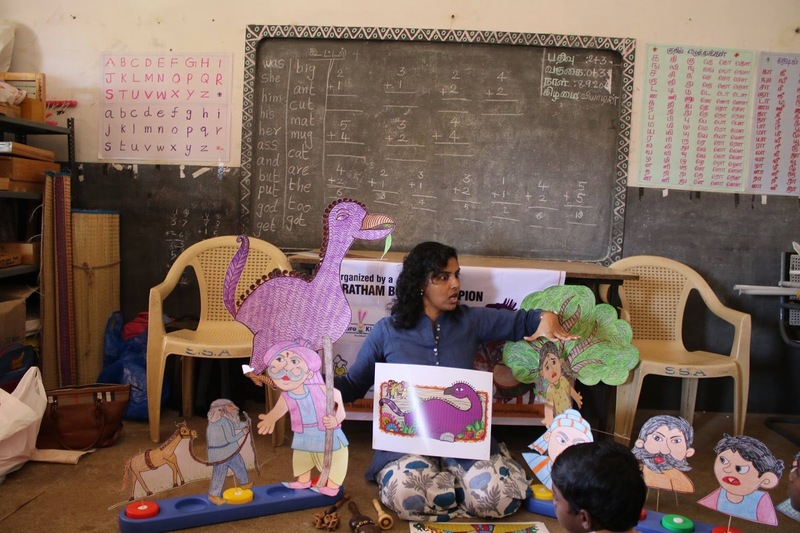 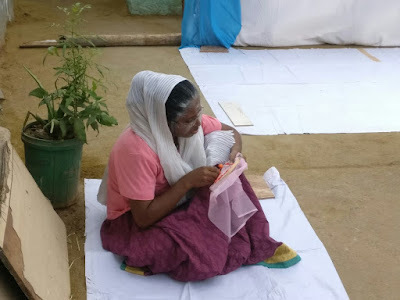 Prior to the Literacy Day event, Mansi Vivek Agarwal gave us a little hint that one of the activities that they were planning with the session was the use of finger puppets. 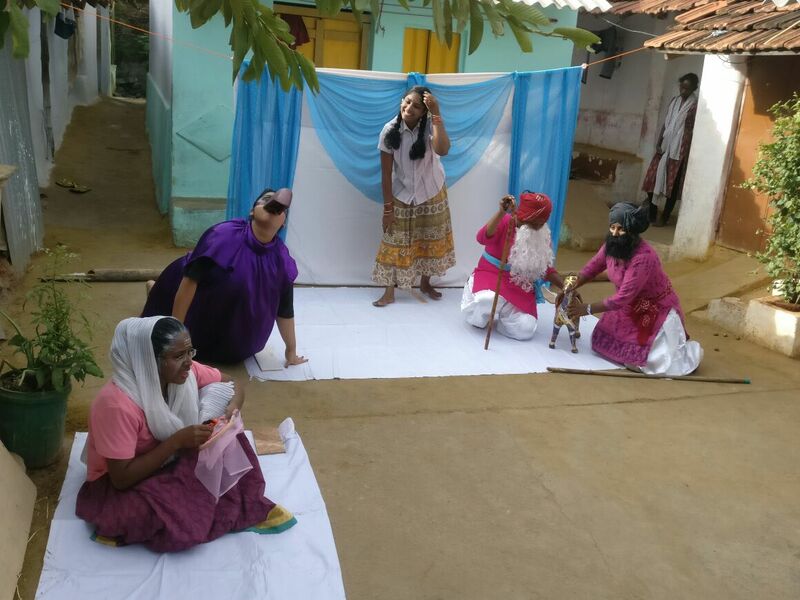 But she did not spill the secret that their performance included a stage and these amazing costumes! 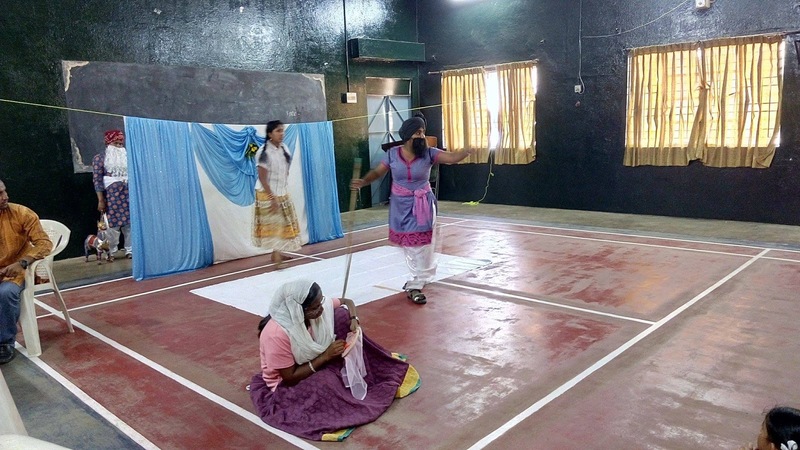 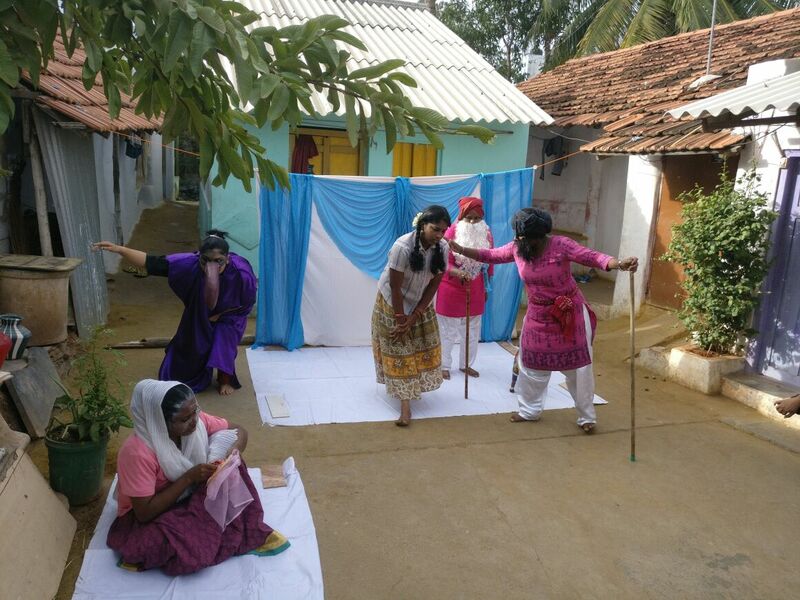 Take a look at the first street play they conducted in a slum in Coimbatore. 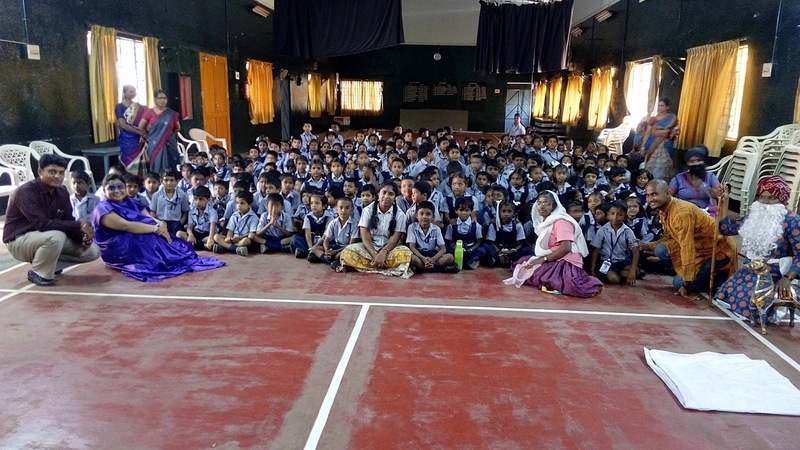 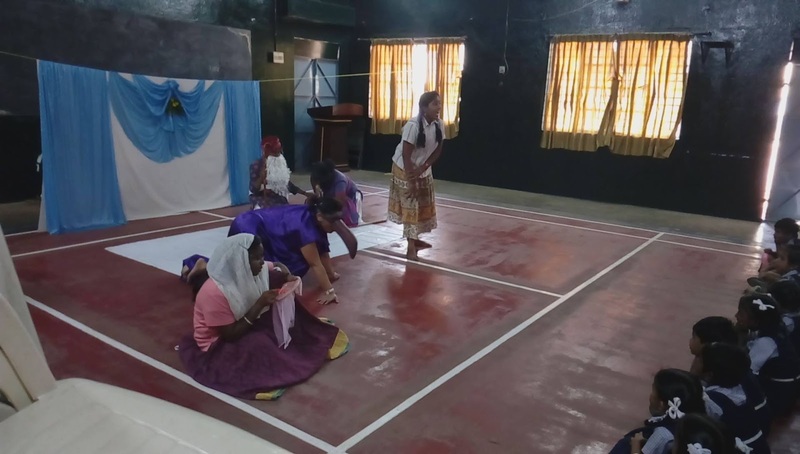 The second play econd play presentation happened today at the KG Matriculation Government Aided School at Coimbatore, more than 70 children participated. Thank you Mansi and Helen O'Grady, Coimbatore for spreading the joy of stories. 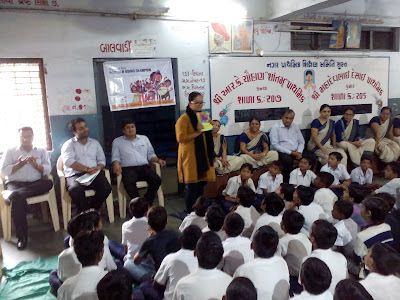 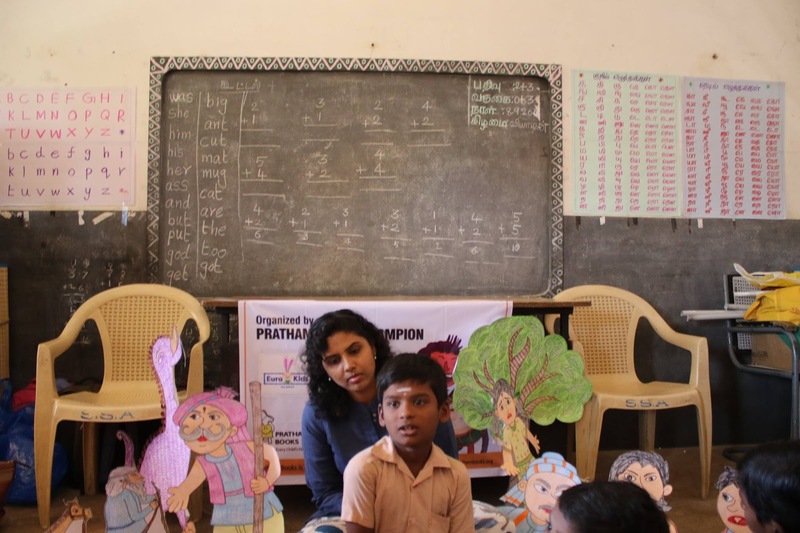 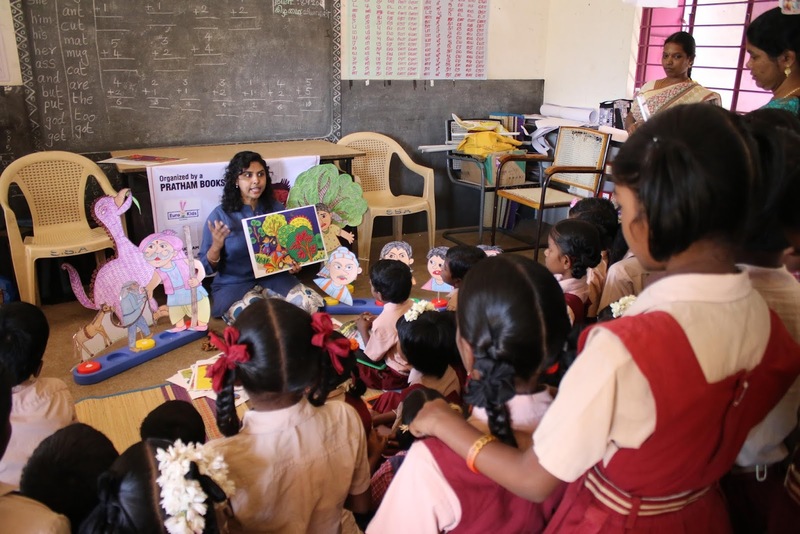 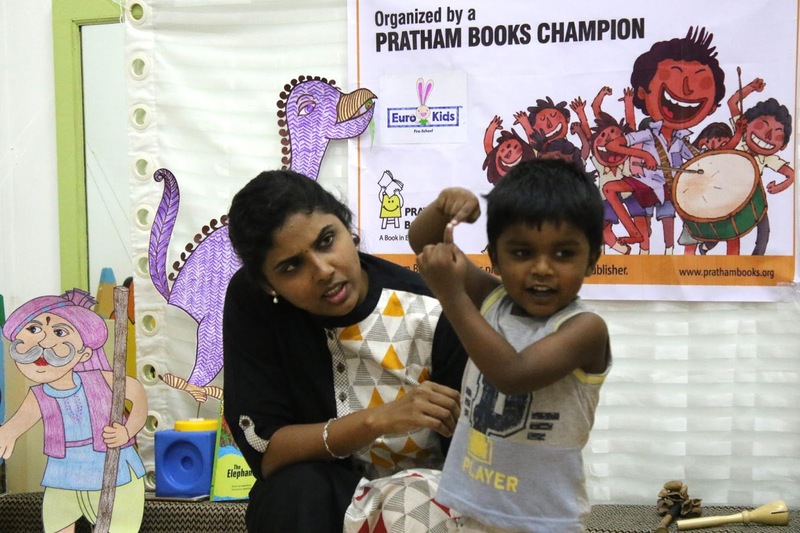 Books for All has been a Pratham Books Champion for a few years now. They sent us the first set of pictures from the sessions that took place at 3 of their centres in Noida. Thank you Books for All team for spreading the joy of stories. 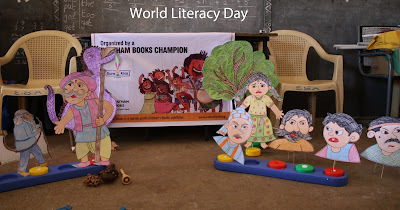 There is no other better way to celebrate the world literacy day than this story telling session ! 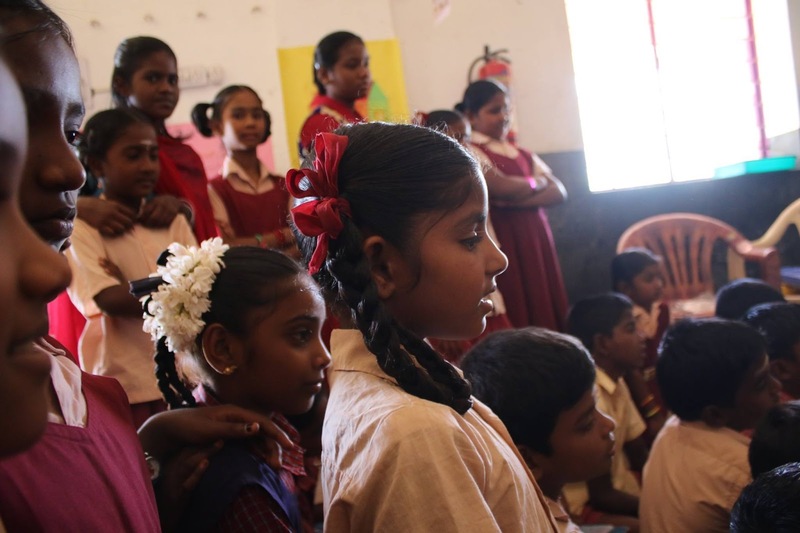 The school where the session was conducted is a government run elementary school where the kids are from very poor background and do not have opportunity to hear stories with illustrations and props. Majority of the kids were the first timers to hear our story. 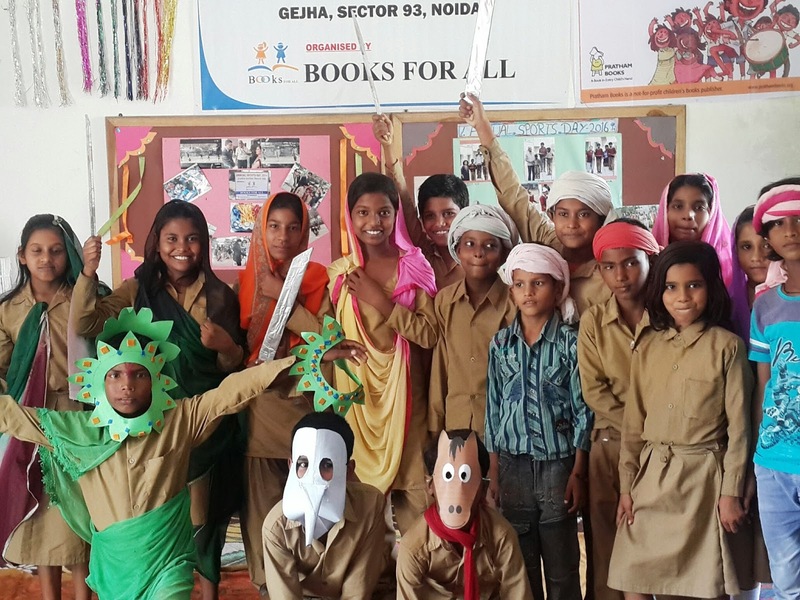 As the story goes on you can spot their imaginations travels through their gleaming eyes. As the author of The elephant bird says , “Who knows, when you go out there in nature, what unexpected friendships you'd form” i just went out in the world & made friends with these young minds. 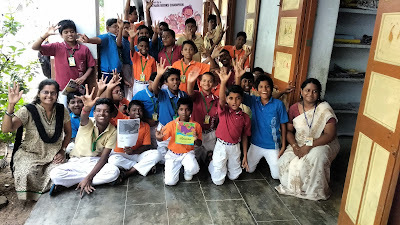 Now they wanted me to visit them often , which i have accepted happily . 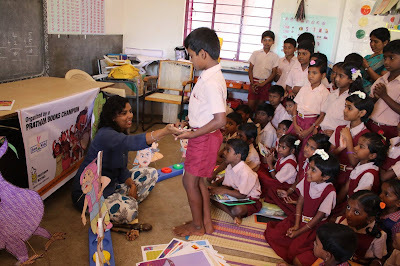 I mean what else can a teller expect more than this. 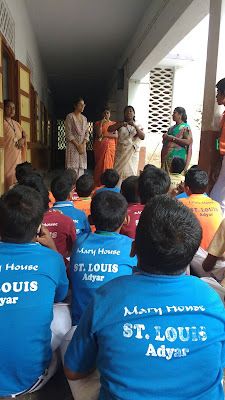 From now on i will visit them every month with an interesting stories. This particular session was done in the evening in our school for our children including their friends from the neighbouring locality. 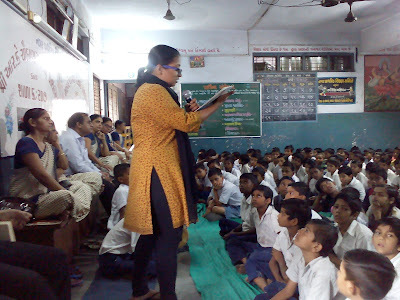 The medium of story was in English. 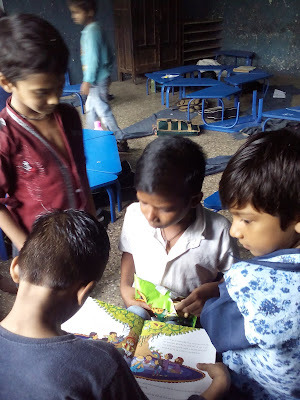 Though these children are familiar with English I was little skeptical about their understanding level, because the age group was from 2.6 to 5 years. 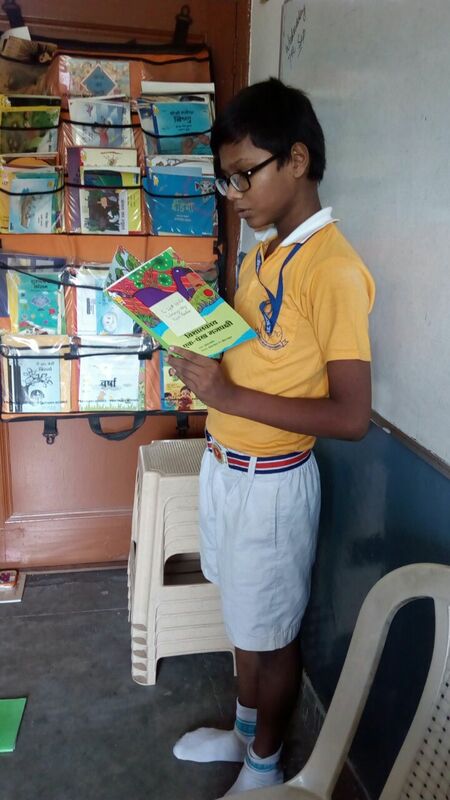 To my surprise, even the youngest listener was able to follow the story and enjoyed it to the heart. 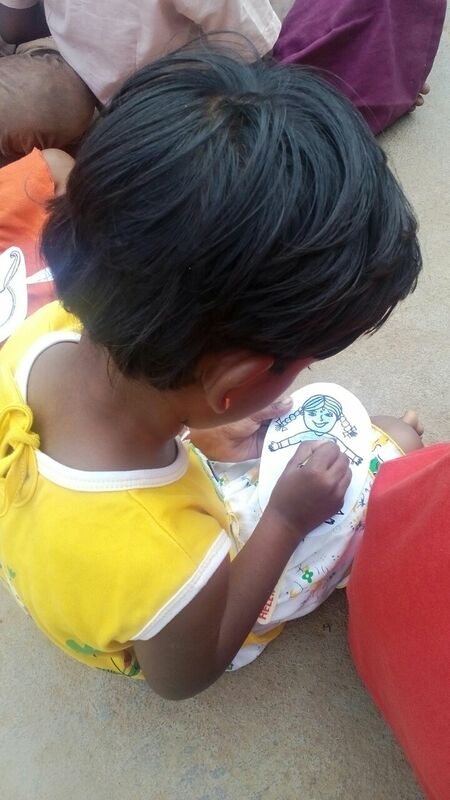 They laughed with Munia, they were worried with Munia, they were even ready to walk with her on the jungle path! I am happy that I was able to put this wonderful story in their memories. 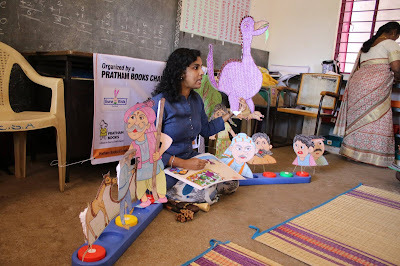 Thank you Shradha for coordinating the sessions and to all the DPS branches for spreading the joy of stories. 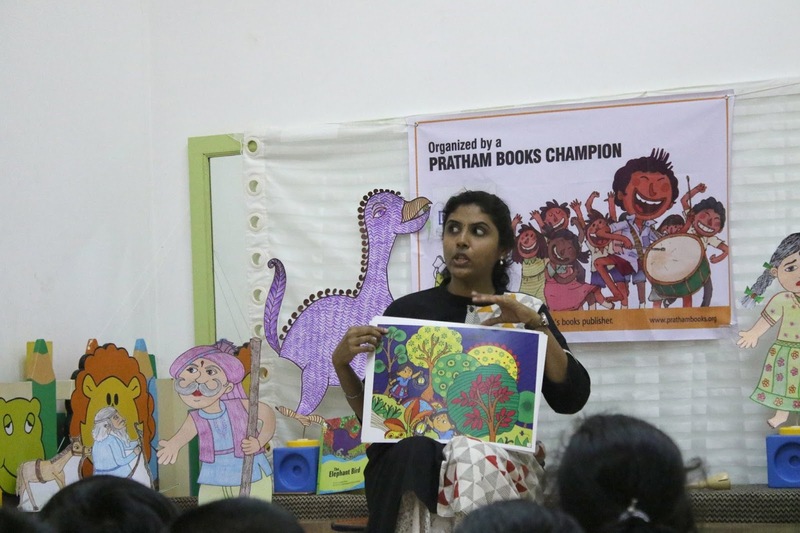 This was the week for Pratham’s book champ and Arundatti read ‘The Elephant Bird’ at Our Lady of Succoor. She was assisted by our student volunteer, Joshua Fernandes. 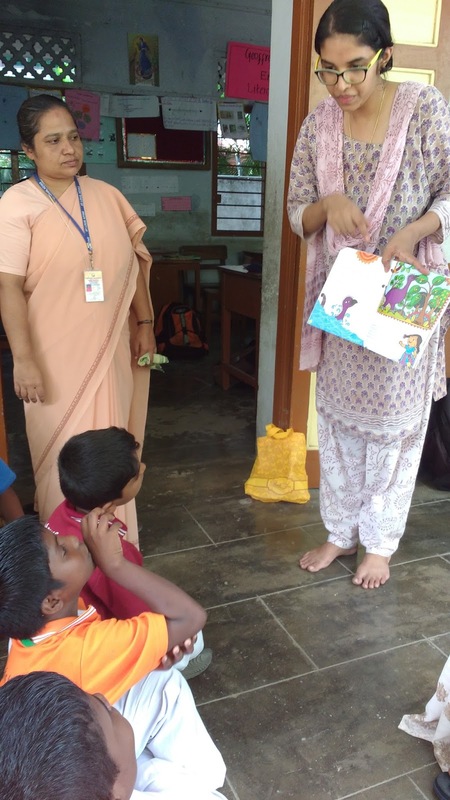 It was read out in the passageway which has been covered from all sides to keep the rainwater away. 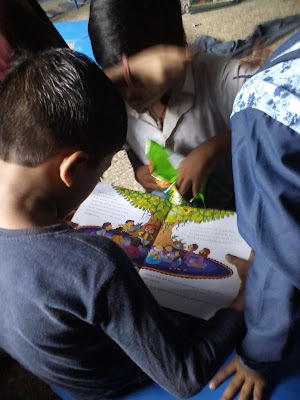 Joshua helped with the e-book. 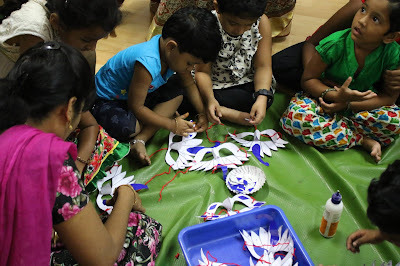 We used yellow ribbon strips to make the bird’s tail with the help of the children. 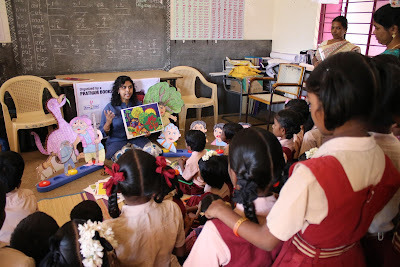 After the story was discussed and read the children enacted parts of it. The boys were also very keen on playing Munia’s character as she came out as the brave one and the girls were amused at being asked to play a male character but they went ahead and did it anyway. 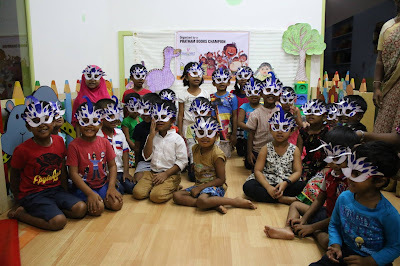 Right in the beginning when no one could’ve guessed the ending, the children came up with many innovative versions to prove the elephant bird’s innocence. 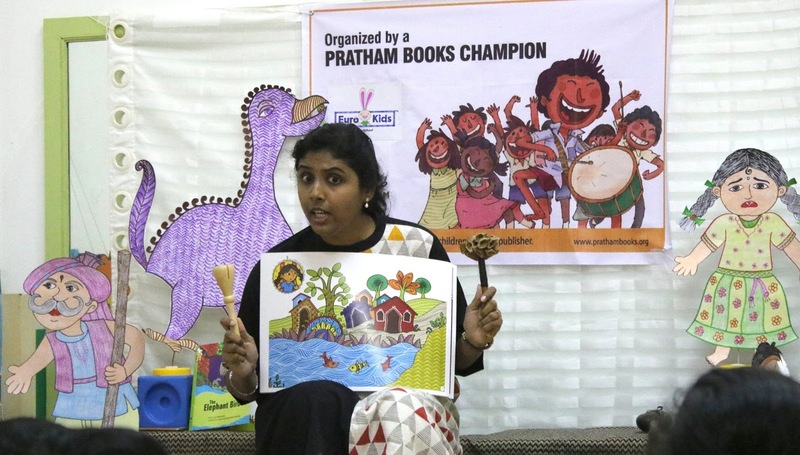 Someone said that Vayu had been invited by the elephant bird to play; hence he was still somewhere in the jungle. 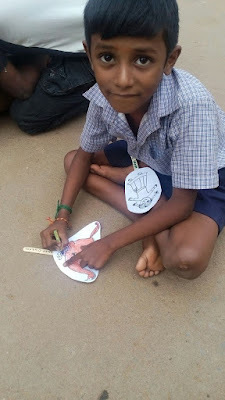 One boy said that Munia trusted him since he was an herbivore therefore he couldn’t have eaten him. It was interesting how children were able to come up with explanations immediately. It was an intriguing story session parts of which have been captured in the following images. 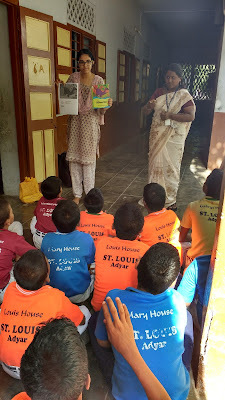 Arundatti reading the story to the children at Our Lady of Succoor with out student volunteer, Joshua Fernandes. The children made a bird tail prop out of a broom stick and some ribbons. 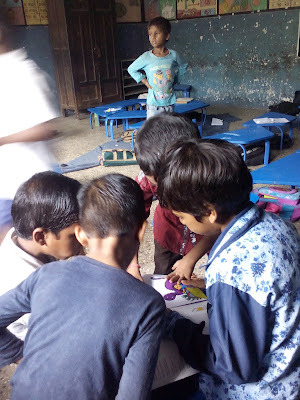 Initially, boys wanted to play the elephant bird while the girls played the role of Munia. 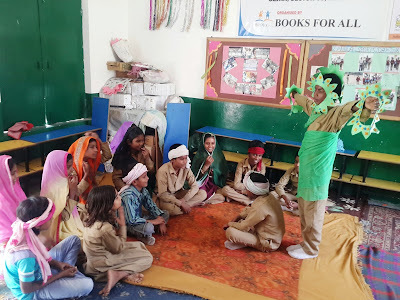 Soon they switched and the girls played the bird while the boys were more than happy playing the role of the little girl. 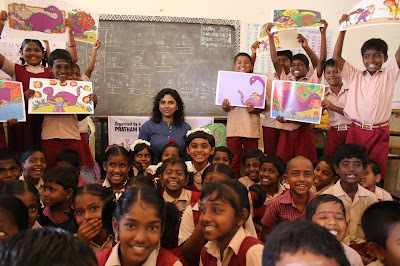 Thank you Arundhati and Bebook Goa for spreading the joy of stories. 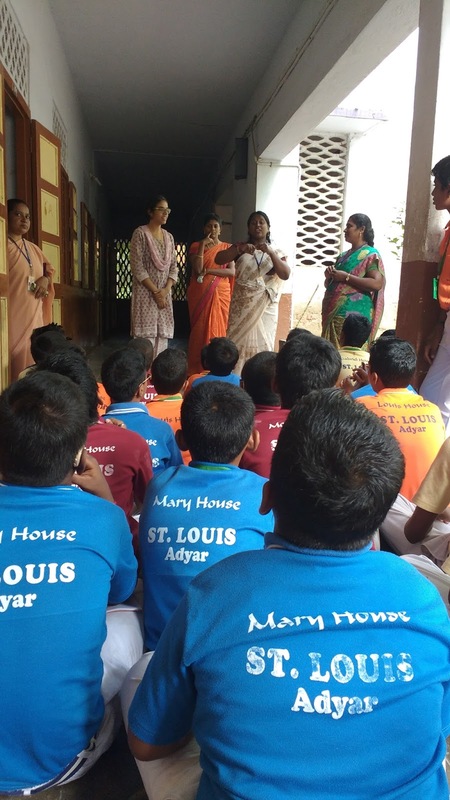 The Book Lovers' Program for Schools sent us this heart-warming account of the storytelling session they conducted at the St Louis Institute for the Deaf and Blind on 7th September, 2016 in Chennai. 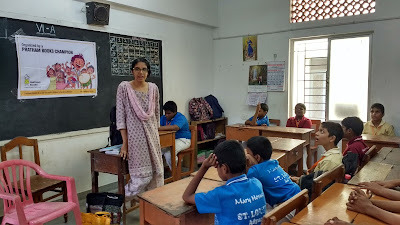 As soon as we read about the event this year, we—at The ilovereadin’ Library—decided to conduct a session at the St Louis Institute for the Deaf and Blind, Adyar. 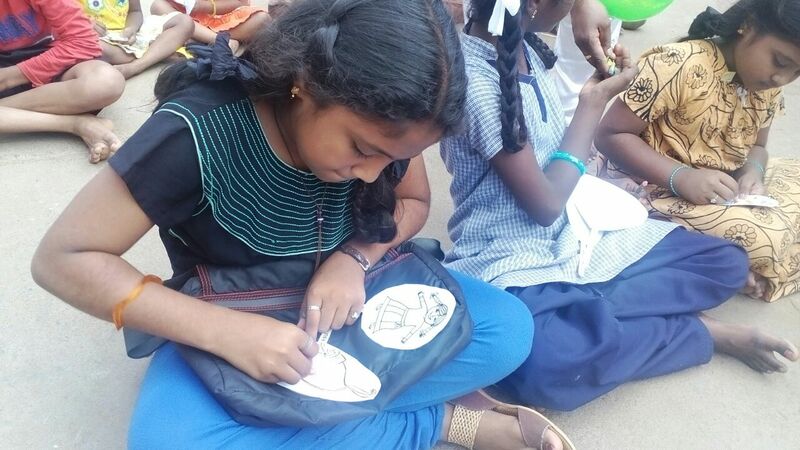 We began a correspondence with the school to fix the date in August, 2016. It was fixed for September 7, 2016 at 2.30 pm, a day when there would be no school functions or exams. 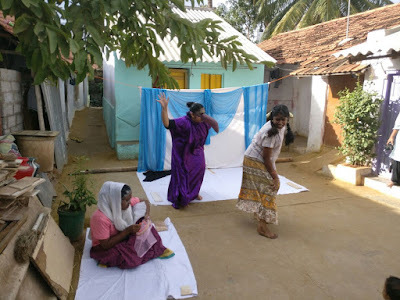 Our storytellers Karthika and Banu settled on using voice, visuals, actions, and textures as the core of their performance. 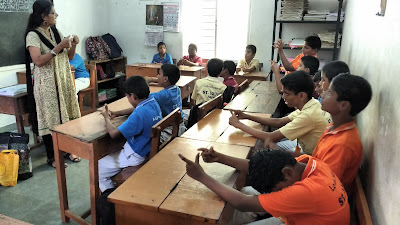 When we reached the school, headmaster John Xavier immediately made arrangements for us to conduct the session. We were ushered to class VI in the block reserved for the visually challenged students. 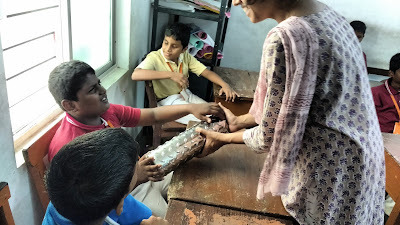 Karthika did a telling of The Elephant Bird followed by getting students to hold a textured metal vase, to help them imagine how heavy and coarse the feet of the elephant bird must have been. them that was where the elephant bird’s socks went. Banu performed a story about Anansi and the Pot of Stories, followed by getting students to hold a calabash that featured in the story. 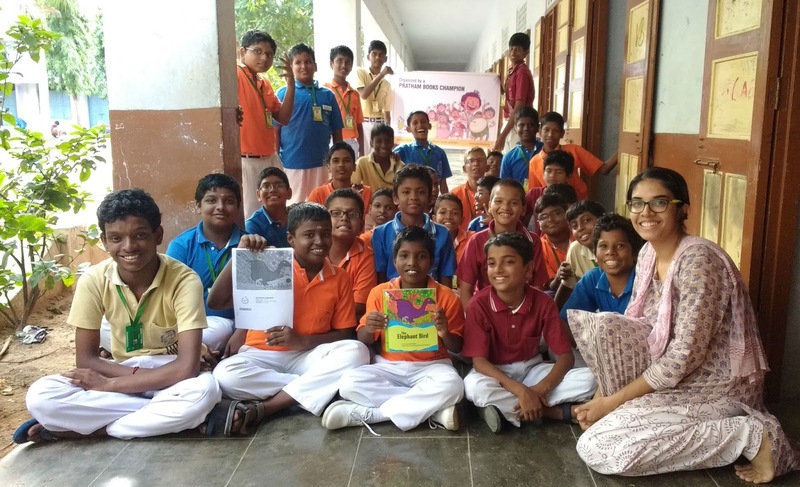 We also donated four English storybooks in Braille that we procured from the Indian Association for the Blind in Madurai to the school. Mrs Delsy, a teacher for the hearing impaired children, was kind enough to depict the story for the children in sign language as we narrated the tale of The Elephant Bird. 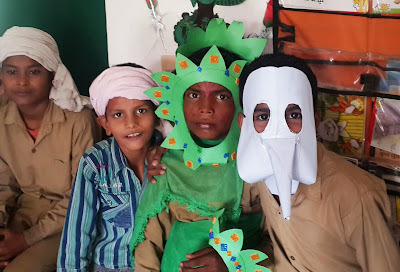 The students identified with Munia’s cause and cheered as she saved the elephant bird. 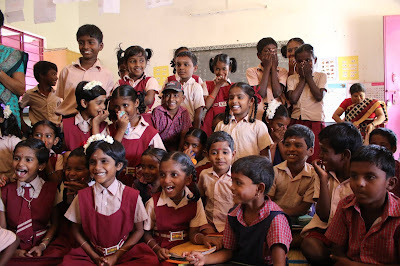 They enjoyed seeing the pictures immensely after hearing the story. 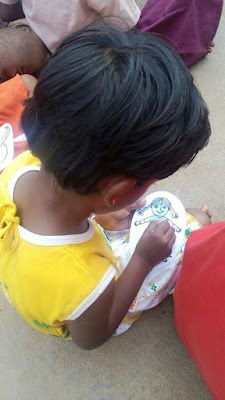 The joy on their faces when they saw the image on paper that connected to the image in their head was a sight to behold. Banu did a storytelling of Plop! 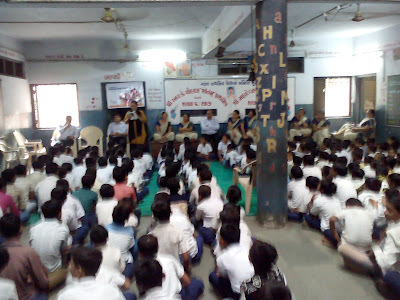 that the students enthusiastically participated in. 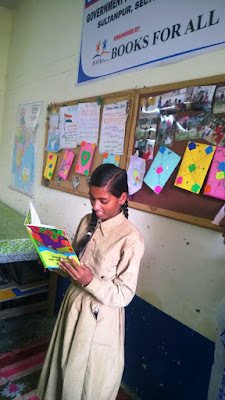 We left behind our copy of The Elephant Bird, in English, for the students to read. 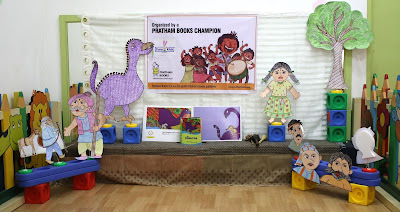 This was sent to us by Pratham Books for the event. 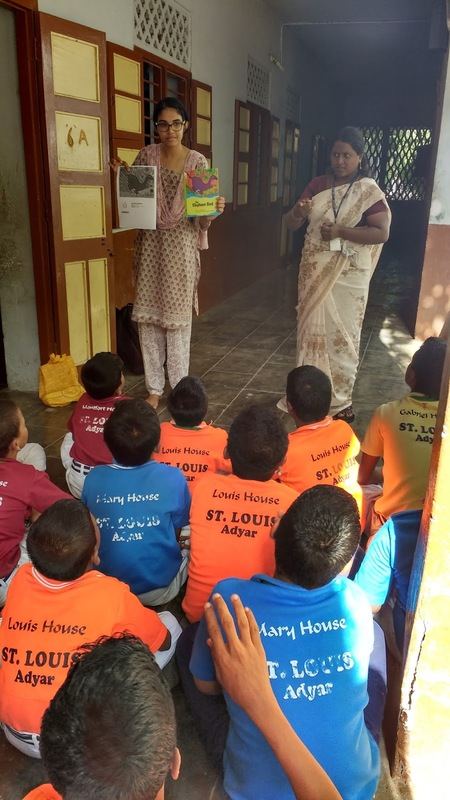 We also left a copy of The Elephant Bird in Tamil that we had printed out for the students to reconnect with the story. 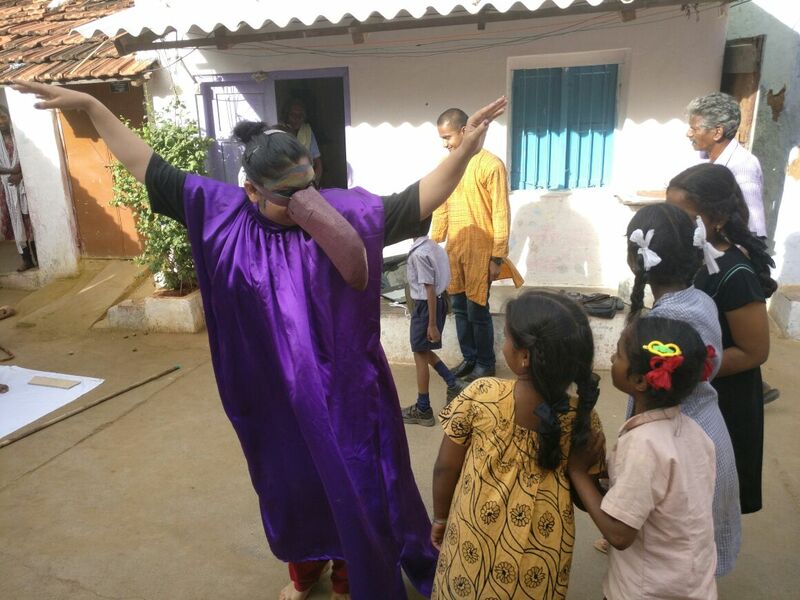 It was an incredible experience. We can’t wait to do it again. 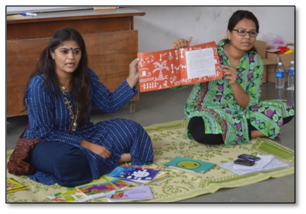 Thank you Karthika, Banu and the Book Lovers' Program for Schools for spreading the joy of stories.